The US Justice Department has appointed Kerri Kupec, who worked for a listed anti-LGBT hate group, to a senior role. Kerri Kupec was this week appointed director of the Office of Public Affairs at the Department of Justice, as part of a reshuffle following the November 7 ousting of Attorney General Jeff Sessions. The new senior DOJ spokesperson has a poor LGBT record, having been employed until January by listed anti-LGBT hate group Alliance Defending Freedom. Kupec, who has a degree from the fundamentalist Liberty University, represented Alliance Defending Freedom at an anti-LGBT rally in November 2017 where she said religious business owners should be free to discriminate against the LGBT+ community. Kupec added that “the belief that marriage is a man-woman union has been held since the beginning of time,” before claiming that enforcing discrimination laws would “drive out” Christians, Muslims and Jewish people from the public square. 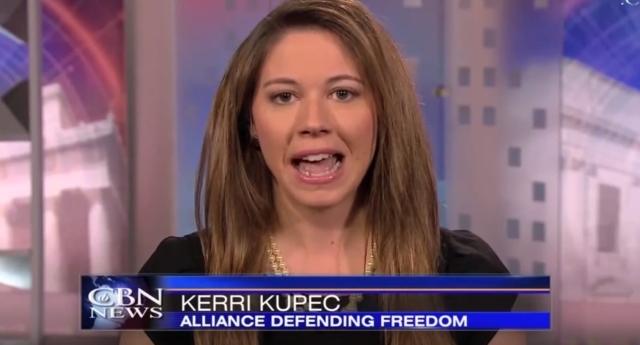 Kerri Kupec of Alliance Defending Freedom was hired by the Department of Justice. The ADF is a shadowy ultra-conservative body that has brought several cases seeking to undermine LGBT+ anti-discrimination protections across the US. The group most notably represented anti-LGBT baker Jack Phillips to advance the argument that religious freedom gives Christian business owners the right to discriminate against gay customers. ADF leaders have previously linked homosexuality and paedophilia. Under Jeff Sessions, the Justice Department maintained close relations with the ADF, frequently weighing in on court battles in support of the group’s lawsuits, and filing a brief to the Supreme Court supporting Phillips.